The word Tahiti has the ability to transport you to a far-away land. Paintings from Paul Gauguin, girls with flower crowns, the red and yellow tiara, the turquoise blue of the ocean, the green of the palm trees, the wavy movements of the grass skirts… All represent the ingredients of a South Pacific odyssey. But the island is also the capital of French Polynesia and, as such, its major urban center. There are roads, shopping malls and petrol stations. There are supermarkets and fast food restaurants. You can even buy a GoPro at the airport. There are also lots of things to do in Tahiti, some of them involve overwater bungalows and umbrella cocktails and others are a little more adventurous and inland. Thankfully, the rugged beauty of the waves lapping against the shore and the peace of a world that moves at its own pace, even in the capital, still define this remote South Pacific paradise. Not to mention the sarong-wearing top-less men. As I arrived on Christmas Eve I decided that the best way to enjoy Christmas Day was to hire a car and circle the island stopping at the main tourist activities. I could have also toured the interior but the weather threatened rain and the inner higher lands are either impassable or absolutely wet. For such a small island Tahiti has rugged and wild heart made of rocky peaks and tall mountains. The circle road is about 120km so it is perfect for a quiet day sightseeing in Tahiti at leisure and for an itinerary to follow to hit all the best things to do in Tahiti. Everything that is in this list of things to do in Tahiti is organised chronologically along the Circle Road so you can just follow the list on a day’s road trip. The Circle Road is easy to follow with Google Maps. To find your bearings you can always refer to the red stone markers by the side of the road that indicate the kilometer. The road starts counting at the market in Papeete both ways and the numbers meet at Taravao. Beware, locals have a tendency to drive really close to your behind and will eventually rush you making you miss turns and kilometer markers which are often not easy to spot. Don’t succumb to their pressures. Following the circle road, I start in town, at Papeete, with a few sights to take in before moving out into the farther lands. You can browse around at Le Marche, the local market selling anything from vegetables and fruits to artefacts and crafts. You can buy vanilla from Taha, coconut oil, flowers and anything made from the traditional local materials such as bamboo or palm tree leaves. Anything that evokes Polynesian culture to the visitor is available. Leaving Papeete, I drive counter clockwise starting with the Southern part of the island. The first stop will be at the Marae in Paea. Maraes are sacred places in Polynesian society. They are common across the Pacific and in New Zealand. The word means “cleared, free of trees” and so you are usually looking for an area that has been cleaned of vegetation. An old battle between two chiefs was fought at Paea Marae. Continue driving along the coast until you reach the Grotto de Marae, at Km 28.5, a nice botanical garden of sorts with waterfalls and a grotto with water. Bring the repellent. I had to run away, literally, being chased by mosquitoes after only one minute. They are fiercely aggressive. You can park the car in a small car park by the water and then cross the road to the nice park. Follow the path and after a couple of minutes you will reach the grotto. The story goes that Gauguin used to swim in that water keeping all the locals out as they feared he had syphilis. It is a peaceful spot to watch the water drops pour slowly from rock condensation. If it wasn’t for the incessant mosquitoes! Ten kilometers after Grotto de Marae you will find Marae of Mahaiatea dedicated to the sea god Ruahatu. A large pyramidal structure once stood there but the stones were sacked for construction usage and all that’s left is a few stones. 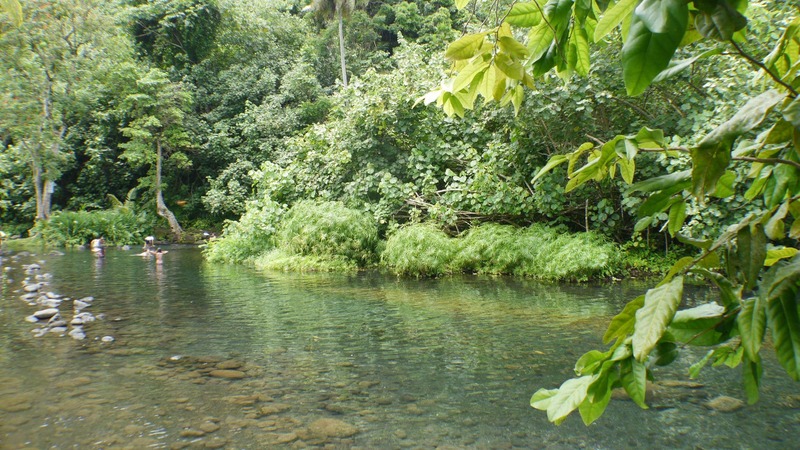 Between Mataiea and Papeari, at Km 49, you should see Vaima Pool (Bain du Vaima). These pools were very popular on the day I went. To reach the deeper pools you have to walk on the narrow edge between the fields and the stream, best to wear strap-on sandals. “Do you want some?” A young Tahitian boy yells at me in French pointing at his bright orange Fanta. I was “invited” by several locals to dive in. As a solo girl I found that locals were of two kinds: they were either very curious and interested in staring and finding out what I was doing, including directly asking me where my husband or family were, or were worried about my safety and felt sorry, the common feeling I got in all other countries across the Pacific. At Tahiti’s main island, the latter dominated. People are used to seeing lots of tourists yet none alone, so I must have been a rarity. At Vaima I got approached several times by locals asking me what I was doing there alone. I did not get into the water, despite looking very inviting, because it was ice cold and I didn’t want to spend the rest of the day wet but it is a great spot for a lunch break. Some locals were selling BBQ snacks. At Km 51 look out for the signs to the Botanical Gardens and Paul Gauguin’s Museum. Here, too, the mosquitoes are terribly hungry and the gardens lush and green. They will both make you feel like you stepped into a tropical jungle, not far from reality after all. Don’t be afraid to continue from Tahiti Nui, the main island, on to Tahiti Iti, the smaller island. Tahiti Iti has not been discovered yet so I did not see any other tourist, only locals going about their day and enjoying the holiday. The island is well-known to surfers though. It is the destination for large waves and surf competitions to rival those of Hawaii. Surfing is one of the best things to do in Tahiti if you are into it. The waves were quite large and they are huge when the surfing season is on. There is no road around the island so you can only drive for a bit before the road ends and you have to retrace your steps. On Tahiti Iti I found the nicest spots and the most isolated roads. There are very few cars and life goes on very slowly, you forget you are in French Polynesia. At times, this part of the island reminded me a lot of Hawaii, after all, the two sets of islands have very similar geography and topography. Most of Tahiti is made of black sand beaches but on Tahiti Iti you will find Toouo beach, a long stretch of white sand that was very popular with locals enjoying Christmas lunch. I stopped by the beach to simply watch the waves die on the shore and took a siesta with the car doors open letting the sea breeze pour in. When you are ready to resume, continue along the beach road from where you will have lush vegetation on the left and the balmy beach on the right. The road ends at Teahupoo, at the most famous surfing spot on Tahiti where the Billabong Pro Tahiti surf competition takes place. There is a large bay with a rocky beach and plenty of surfers catching waves to watch. The waves are said to reach up to 7m at times and regularly roll in at 2-3m. A hanging bridge is the perfect spot for kids to jump off into the river beneath. A couple of stalls sell drinks and snacks. It got a bag of crisps to accompany the rest of the journey as I you-turned back into Tahiti Nui. Once you get back on the main island you will drive past Taravao at which point you can take the road that goes into the northern part of Tahiti Iti. I did not not take this one but you would advised to check it out as I was told by a few people that the views from Tautira are idyllic. 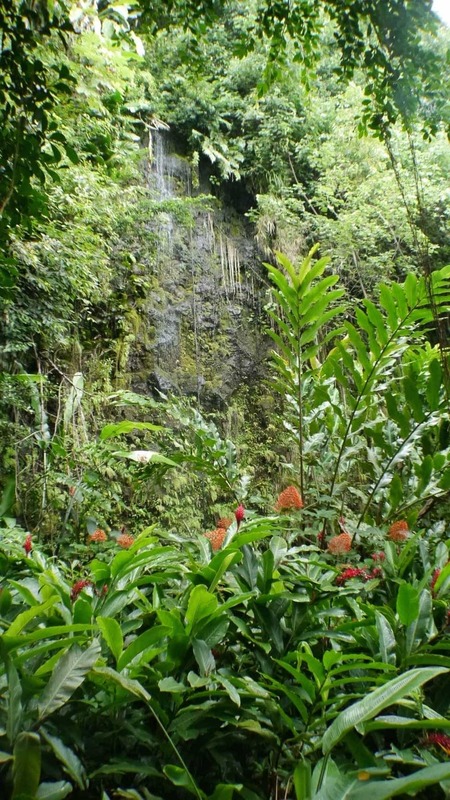 At PK22, on the northern side of Tahiti Nui, you can find the Arahoho Blowhole. When the sea is rough expect to be showered by this spitting natural phenomenon. Careful if you are viewing from the platform, it is not a safe place on days when the blowhole is active. You can park your car nearby and there is a black sand beach next to it which provides action to the few surfers around. I was told that, because it is such a popular destination, I would not miss the tourist buses that regularly stop by, right by the road. Continue to Point Venus, at PK10, where Captain Cook decided to follow the sun and noticed the transiting of Venus over the sun, hence the name. I couldn’t find the turn to the point so I kept going around until I asked someone to point me there. There is a nice black sand beach and, since it was Christmas Day, there were several families picnicking around and having a bath. Just before you arrive at Papeete, at PK5, you will see the James Normal Hall’s Home (Maison James Normal Hall, site here). This is perhaps one of the few historical places on the island and a visit is one of the most interesting things to do in Tahiti. Hall is famous for co-authoring The Mutiny on the Bounty trilogy with his friend Charles and many other books, six of which were turned into nine Hollywood movies. Aside from a prolific writer, at his Home-Museum, you can also find out about his life. The famous writer enlisted in the army of three nations during World War I and finally settled in Tahiti after the war ended. Storytelling must have run in the family lineage because Hall’s son, Conrad, won Academy Awards for ”Butch Cassidy and the Sundance Kid,” ”American Beauty” and ”Road to Perdition. This is a good way to end the tour and your sightseeing of Tahiti. The absolutely delicious and addictive poison cru kept encouraging me to have another serving. I feasted on this Polynesian version of ceviche almost every day of my stay in Polynesia. Raw fish is marinated with onion, tomatoes and coconut milk. The best way to enjoy this is while watching the melodic sound of the Polynesian music, the singing and the rhythmic moves of the dancers. Polynesian dancers and shows are available every week at all major luxury hotels in Bora Bora and Tahiti so you just need to check the schedules at each of them. I watched the Polynesian dancers at the Intercontinental in Tahiti, the Intercontinental in Bora Bora and the the Intercontinental Thalasso Resort & Spa in Bora Bora. I also watched the dancers in the Cook Islands. Tahiti is a contrast of progress and remoteness. It is an island lost in the ocean, hours from civilization, where deliveries can take weeks at sea. But, at the same time, it is strongly linked to the French colonial past and feels more modern and advanced than most of the Pacific. A road trip is an excellent way to take in life and history in a way no other island in French Polynesia can offer.